[115 Pages Report] The global drug discovery informatics market is projected to reach USD 2.84 Billion in 2022 from USD 1.50 Billion in 2016, at CAGR of 11.2% during forecast period. The base year considered for the study is 2016, and the forecast for the market size is provided for the period between 2017 and 2022. In the current market scenario, there is a growing demand for discovery informatics solutions. The major factors driving the growth of the global market include the rising R&D expenditure, the increasing focus on drug discovery, and need to control the drug discovery and development cost. On the other hand, the scarcity of skilled professionals, and high pricing and setup cost of informatics software are the major factors restraining the growth of this market. Top-down and bottom-up approaches were used to validate the size of the global drug discovery informatics market and estimate the size of various other dependent submarkets. Major players in the market were identified through secondary research and their market presence was studied through primary and secondary research. Secondary research included the study of the annual and financial reports of top market players, white papers, medical journals, certified publications, articles from recognized authors, directories, and databases such as Statista, Clinicaltrials.gov, American Association of Pharmaceutical Scientists (AAPS), Pharmaceutical Research and Manufacturers of America (PhRMA), NCBI, International Trade Administration (ITA), European Federation of Pharmaceutical Industries and Associations (EFPIA), whereas primary research included extensive interviews with key opinion leaders such as CEOs, directors, and marketing executives. The percentage splits, shares, and breakdowns of the segments were determined using secondary sources and verified through primary sources. This data is consolidated and added to detailed inputs and analysis from MarketsandMarkets and presented in this report. The key players operating in the drug discovery informatics market are IBM (US), Infosys Ltd. (India), Schrödinger (US), PerkinElmer (US), and Thermo Fisher Scientific (US). 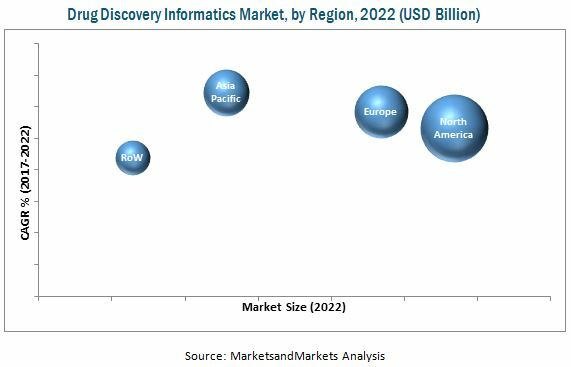 The global drug discovery informatics market is expected to reach USD 2.84 Billion in 2022 from USD 1.67 Billion in 2017 at a CAGR of 11.2%. The pharmaceutical industry deals with a huge amount of data in the process of drug discovery. Moreover, it takes approximately 10 years to bring a drug to the market from the start of the discovery process and drug discovery alone accounts for approximately 4 years of that time frame. The complete process of drug development and commercialization can cost as much as USD 1 to 2 billion. With such huge investments at stake, drug discovery informatics can help target the right compound and avoid negative outcomes. Rising R&D expenditure across the globe, increasing focus on drug delivery, and the need to control drug discovery and development costs are the factors driving the growth of this market. In this report, the market has been categorized based on function, solution, end user, and region. Based on function, the drug discovery informatics market is divided into sequencing and target data analysis, docking, molecular modeling, libraries & database preparation, and other functions. In 2017, the sequencing and target data analysis segment is expected to account for the largest share of the market. Factors such as the expansive application of informatics solutions in targeted analysis and the large amount of data generated during the drug discovery process are driving the growth of this segment. In 2017, in terms of value, North America is expected to account for the largest share of the global drug discovery informatics market. Asia Pacific is expected to register the highest growth rate from 2017 to 2022. This can be attributed to the fastest-growing APAC pharmaceutical market in the world, the availability of many qualified researchers, and the low cost of human resources and manufacturing. The scarcity of skilled professionals and the high pricing and setup cost of informatics software are the major factors expected to restrain market growth. The key players in the drug discovery informatics market are IBM (US), Infosys (India), Schrödinger (US), PerkinElmer (US), and Thermo Fisher Scientific (US). These players focus on inorganic strategies such as acquisitions, agreements, and collaborations as well as organic strategies such as product launches and expansions to sustain their growth in the global market.